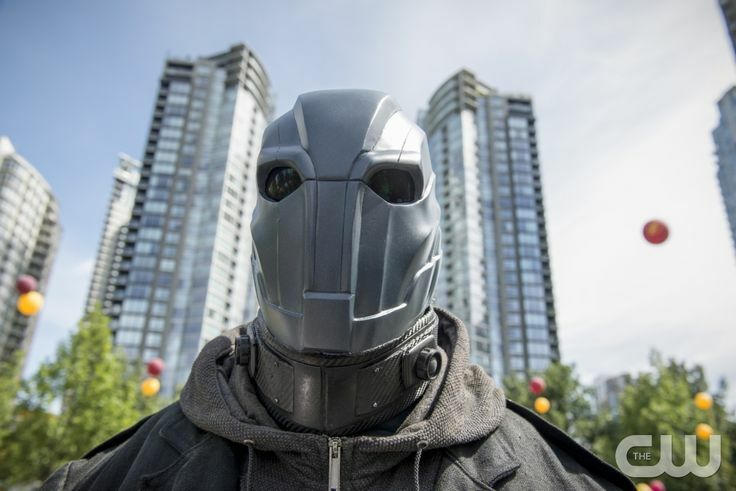 The Flash Season Two Premiere Recap: "The Man Who Saved Central City"
If you remember, last May there was a giant black hole swirling over Central City because of Eobard Thawne (Harrison Welles). Eddie has died to save the future. And now Barry faces unbeatable odds as he launches himself into the vortex, hoping to stop it in any way he can. The premiere picks up with Barry fighting Captain Cold and Heat Wave with the help of FIRESTORM. They are successful and return to STAR Labs for a celebration. Barry greets Cisco and Caitlin. And Iris and Joe. And Eddie??? And Welles?!?!?! Welles gets up from his wheelchair and approaches Barry. Then the scene flashes to present day; it's all been a daydream. Barry stands in a darkened--apparently abandoned--STAR Labs, alone. He looks awfully sad (Poor Barry Baby). A computer behind him beeps. He dons his red suit and zooms off. This causes a pile of unopened letters to flutter through the air. Up-close, they're addressed to Barry with a red stamp that reads: URGENT. As Barry races through the city, he does the famous voice: "My name is Barry Allen..."But his voice is significantly sadder, and the message is changed. It's been six months since the black hole incident. And Barry works alone. There are also signs across the city that read: "Flash Day." There's been a murder at the nuclear plant. Joe arrives to hear Barry's verdict about the victim's body. They determine he wasn't killed by GRODD. Then Barry says he isn't sure if he should show up for Flash Day. He says he doesn't deserve an award for what he did. (WHAT HAPPENED BARRY? WHAT HAPPENED WITH THE BLACK HOLE???) A man takes pictures of the crime scene crowd, specifically of Barry. The police captain talks to Joe at the precinct, mentioning Joe's newly formed anti-meta-human task force. Cisco--of course--is part of the team. (I'm so excited for my Joe and Cisco time.) We learn Caitlin now works at Mercury Labs. Iris arrives to see Joe, and Joe suggests Iris should try to talk to Barry about Flash Day. She doesn't look too thrilled, and the feeling doesn't change when she spots a photo of Eddie on the wall. Barry is at the old cafe he used to hang out at with Iris. He's cleaning the place up, trying to make it how it was before the Black Hole incident. Iris arrives to chat. She says there's been a lot of nightly work being done on old businesses in the area. Obviously Barry's been trying to help. She tries to convince him to go to the Flash rally, but he refuses again. He says he's not a hero. (Seriously, what happened???) Iris tells him that Central City believes in the Flash and so does she. The city is being ripped to shreds: cars fly through the air, people are whisked away, buildings crumble to pieces. Barry zooms up the building to launch inside the black hole. He's zipping around in a circle, which, according to Dr. Stein, will contain it by adding to its angular momentum. However, Dr. Stein realizes it's not enough. He can't hold it much longer. But if FIRESTORM were to separate inside the eye, it should close it somehow. Caitlin protests (she did just get Ronnie back and they got married), but Ronnie says they need to try. They do, to Barry's dismay. It works and stops the black hole. However, it causes all three of them to plummet from the sky. Barry grabs hold of Dr. Stein and manages to get him to the ground safely. But there's no sign of Ronnie. He's gone. 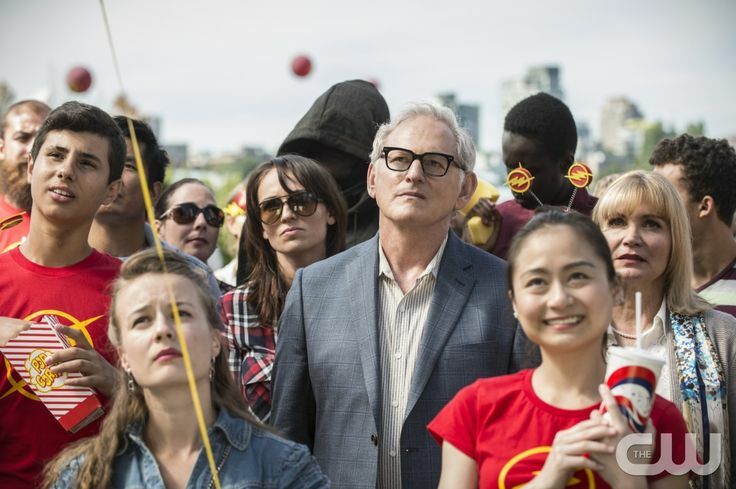 Flash Day arrives with grandeur: music, people donning red shirts with the Flash symbol, politicians, red and yellow balloons, the whole shebang! Joe, Cisco, Iris, Dr. Stein, even Caitlin are all there, but there's no sign of the Scarlet Speedster. The Mayor gives a speech to present the key of the city to the Flash--their own personal hero. Then, Barry arrives in a flash of yellow and red. He accepts the key as the crowd chants his superhero name. Joe and Cisco, at the precinct, look into the man's background. His body is still in the morgue and he wasn't even in town for the particle accelerator explosion. Iris arrives to talk to Joe. She knows Barry can't do this alone anymore. She suggests they help him and don't let him say no. Cisco visits Caitlin at Mercury Labs. He, of course, fanboys over the tech before asking Caitlin for help with this meta-human. Barry--in forensics lab--reads over a newspaper that has the headline: Flash Fail. A man comes in--the one who has sent him all the unopened letters. He's an attorney for Welles' will. They discuss the state of STAR Labs. Welles left it to Barry in his will. He also left Barry a video message, which Barry refuses to watch. Suddenly, there's an urgent message about activity inside STAR Labs. He races over there to find the whole gang is back and investigating the meta-human. Barry tells them to leave, but they refuse. They say they want to help find out where the "Atom-Smasher" is, as Dr. Stein dubs him. Cisco is all smiles at the new nickname. Joe tries to convince Barry he needs them, but Barry refuses again. He zooms off, leaving his comm device behind. The STAR gang can't assist him. Barry, of course, confronts Atom-Smasher. Cisco cleverly hacks into the security cameras of the building to take a peek. Barry and Atom-Smasher fight, and Barry isn't winning. Dr. Stein suggest they turn on the alarm system as a distraction. It works, and Barry is able to get away. He returns to STAR Labs, out of breath and groggy. He passes out. A young Barry refuses to eat, despite Joe's encouragement. It's been six months since his mother died and his father was accused and sent to jail. Joe gives Barry a pep talk, and Barry embraces Joe. It's lovely, tender moment between the two. 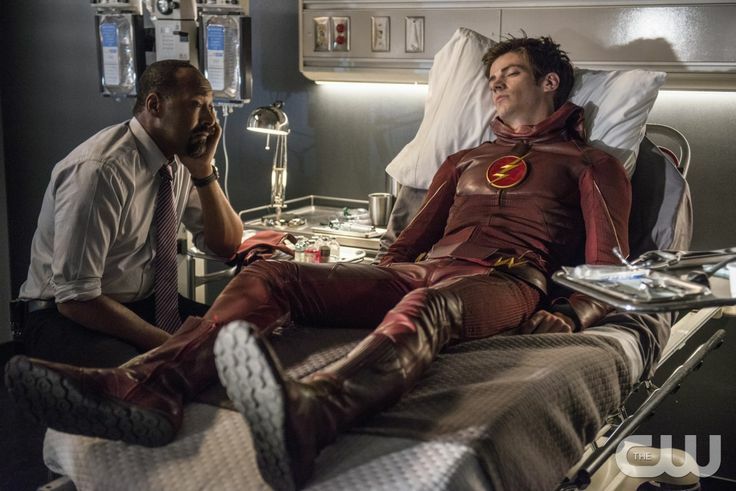 In STAR labs, Joe sits by Barry's bedside. Barry wake up, and Joe tells him they can't do this anymore--he can't do this alone. But Barry is worried about getting his friends killed, like what happened to Eddie and Ronnie. Joe reassures him it wasn't only Barry's choice that day. They all made their decisions to help him. Joe tells him to start rebuilding the things that matter. Barry visits Caitlin at Mercury Labs. Caitlin reassures Barry that he was the hero that day. She tells him that it wasn't his fault Ronnie died (again). Barry tells Caitlin about Welles' living-will video. She offers to watch it with him. Welles tells Barry they were never truly enemies. He offers to give Barry everything he wants: he then confesses that he killed Nora Allen. With this evidence, Barry can get his dad out of jail now. Barry meets everybody at STAR Labs. He admits he can't defeat Atom-Smasher alone. He asks his team for help. Caitlin--who learned that Atom-Smasher likes radiation--suggests they give Atom-Smasher radiation to lure him in. They've apparently created a "Flash signal" to light up the sky. Cisco pokes fun at once seeing the same thing in a comic book once (may I suggest Batman?). The signal works: Atom-Smasher arrives. Barry taunts him, saying he has to catch him. He leads him to a reactor core (in STAR labs?). They trap him in and flood the chamber with so much radiation he can't absorb it all. When Atom-Smasher is down and the room is clear, Barry goes in.He asks why he wanted to kill him. Atom-Smasher says, "He promised to take me home if I killed you." Barry asks who, and he replies, "Zoom." Barry greets his dad as he leaves jail. He's crying. His dad is crying. I'm crying. Everybody's crying. They have a welcome home party for Henry. I'm still crying. Everything's so happy and gung-ho. Something sad is coming, right? At STAR Labs, Barry meets the gang. Cisco shows him an upgraded suit: the symbol now has the white background like the suit from the future! They've even upgraded the security system of STAR Labs. No more unexpected visitors can barge in now. Then, of course, a mysterious man arrives. He says they don't know him, but he knows them... Barry in particular. He steps forward and says, "My name is Jay Garrick and your world is in danger." I'm screaming! Meta-humans! Barry's new suit! Fun new team! Cisco! Henry's out of jail! Professor Zoom! JAY GARRICK!!!! (Fun fact: Jay Garrick is the first Flash in the comic books. 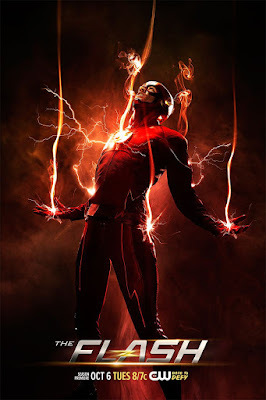 They've cast him to be a version of The Flash from an alternative universe, like the one Cisco sees in his vision.) This season is going to be so much fun. I can hardly wait. What did you think of the season two premiere of The Flash? What are you looking forward to this season? All photos from The Flash's Official Facebook Page or The CW's official photo gallery for The Flash.